Monday 28th May 2018, will ever remain memorable in the history of Igbo Biafrans as a day the youths of the Indigenous People of Biafra (IPOB), adorned themselves with the reputable traditional title caps (hats) during the last sensitization campaign rallies, preparatory for the 30th of May annual Heroes and Heroines Remembrance Day "Sit-At-Home", held in Onitsha, Anambra State, Biafraland. This incident is an indisputable proof that the present day Igbo population is bereft of elders with conscience, respect and dignity. These elders have disappointedly reneged on their traditional responsibilities of remedying the anomalies prevalent in the land, hence the intervention of the youths. This young generation of Biafrans have taken the only available option of assuming the roles of the elders for the preservation of the honor and dignity associated with Igbos which are regrettably dying in the hands of the highly compromised elders of which Ohaneze Ndigbo Group is one. Igbo Biafrans are better given reputable and blameless representation anywhere in the world by individuals who have uncompromisingly made sacrifices for the interests of their people. Such persons include young men like Benjamin Mmadubugwu, David Nwawuisi and Bright Chimezie, amongst others who have spent close to three (3) years in detention for the Biafran restoration struggle without capitulation. These are men of unquestionable characters unlike Chief John Nnia Nwodo, Chief Emmanuel Iwuanyanwu, Orji Uzor Kalu and the South East Governors who are shamelessly sabotaging the interest of their people for crass frivolities. It is a common culture in Biafraland that youths do not stand unconcerned, watching the morally bankrupt elders especially those planted by Sokoto Caliphate in the mould of Ohaneze Ndigbo and the South East governors, to mortgage the prestige of the people unchallenged. Such can only happen in places like Benue state, Taraba state and in Southern Kaduna, where youths helplessly stand aloof while their elders respectively play politics with the lives of their kiths and kins to please their Fulani slavemasters. In the entire Biafraland, Mazi Nnamdi Kanu, the indefatigable and courageous leader of the Indigenous People of Biafra (IPOB) worldwide, has proactively and effectively tutored the youths to always assess the political activities of these so-called elders. 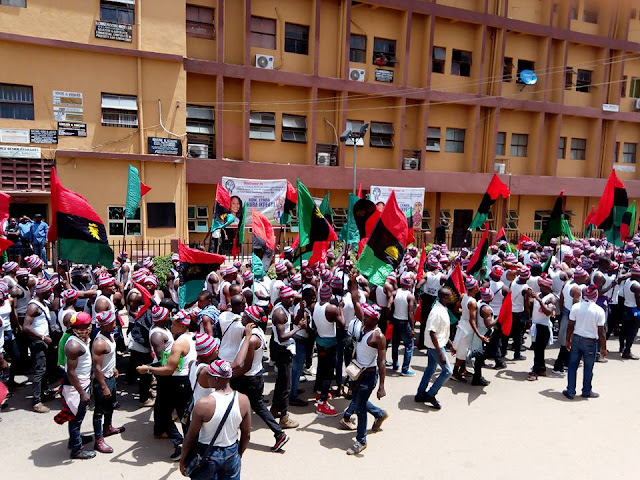 It is in keeping with this age-long culture of dignity and honor that jolted the Biafran youths to demonstrate in Onitsha, the way they did, that they have collectively passed a vote of no confidence on such elders like John Nnia Nwodo, the entire Ohaneze Ndigbo membership and their fellow accomplices in Government Houses (Governors) in the South East particularly. The wearing of the revered cultural hats (caps) ostensibly made for reputable elders in Biafraland is both informative and redemptive. The action of these youths in the Onitsha rally is a definitive statement, putting a seal of stoppage on the political impunity of the supposed Igbo elders. Sometime in the past, John Nnia Nwodo shamelessly and openly confessed in Lagos that he is a proud saboteur of the Biafra restoration effort, which he very well knows, is the genuine desire of the majority of the Biafran people. Most assuredly, offenders who are making caricature of the sacrifices of the people for freedom due to their personal gains must receive appropriate punishments in due time. As for the youths of the Indigenous People of Biafra (IPOB), they have judiciously used the sensitization campaign rallies which simultaneously and respectively held in Onitsha, Aba, Port Harcourt (Igweocha) amongst others, to awaken the consciousness of the people on the need to stay indoors and give in-depth reflection on the priceless sacrifices of our fallen Heroes and Heroines. Wednesday 30th of May 2018, remains sacrosanct which implies that all Biafrans will conscientiously observe the day in respect of our gallant warriors both dead and living who have in no small measures, staked their lives for our survival. All human and vehicular traffics will be effectively deactivated across villages, towns and cities within Biafraland. IPOB has no regrets whatever, for any attached inconveniences even as defaulters to the requirements of this all important event will not be condoned.